63 Marlborough is located on the north side of Marlborough, between Berkeley and Clarendon, with 61 Marlborough to the east and 65 Marlborough to the west. 63 Marlborough was designed by architect J. Pickering Putnam and built in 1875-1876 by Isaac Franklin Woodbury, mason and builder, for Dr. Charles Pickering Putnam, a physician specializing in pediatrics and orthopedics, and his brother, Dr. James Jackson Putnam, a physician specializing in neurology. The architect, J. Pickering Putnam, was their first cousin. Charles and James Putnam purchased the land for 63 Marlborough on June 8, 1875, from the Commonwealth of Massachusetts. Charles Putnam, et al, are shown as the owners on the original building permit application, dated April 9, 1875, and on the final inspection dated February 25, 1876. Click here for an index to the deeds for 63 Marlborough. 63 Marlborough became the home of Charles and James Putnam and their unmarried sisters, Elizabeth Cabot Putnam and Anna Cabot Putnam. They all previously had lived at 24 Marlborough with their parents, Dr. Charles Gideon Putnam and Elizabeth (Jackson) Putnam, both of who had died in February of 1875. James Putnam married in February of 1886 to Marion Cabot and they moved to their own home at 106 Marlborough. Charles, Elizabeth, and Anna Putnam continued to live at 63 Marlborough. On April 21, 1886, Charles Jackson purchased his brother’s half interest in the house. From about 1885 to 1890, the Putnams were joined by Madeline (Yale) Wynne, the former wife of Henry Wynne and daughter of lock manufacturer Linus Yale. Living with her was her son, Sydney Yale Wynne. Anna Putnam and Madeline Wynne both were artists. Charles Putnam married in June of 1889 to Lucy Washburn. 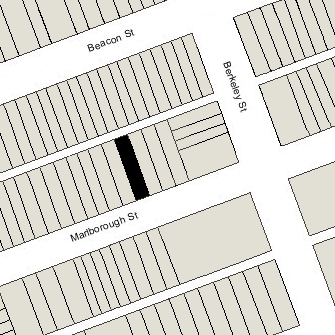 They continued to live at 63 Marlborough; Elizabeth and Anna Putnam lived with them. 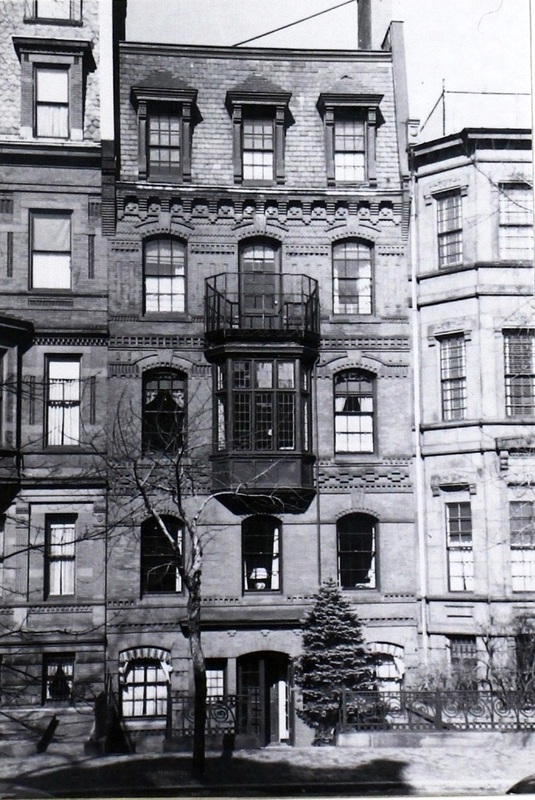 In about 1908, Elizabeth Putnam moved to live at 104 Marlborough, which had been purchased by her brother, James, next door to his home at 106 Marlborough. Anna Putnam remained at 63 Marlborough. Charles Putnam died in April of 1914. His widow, Lucy, and his sister, Anna, continued to live at 63 Marlborough during the 1915-1916 winter season, but by mid-1916 had moved to 108 Marlborough, next door to James Putnam. On July 17, 1916, 63 Marlborough was acquired from Charles Putnam’s estate by Edith (Wood) Dexter, the wife of Philip Dexter. They lived at 65 Marlborough. 63 Marlborough was not listed in the 1917 Blue Book. On March 8, 1917, 63 Marlborough was acquired from Edith Dexter by cotton broker Rudolph Weld. He and his wife, Sylvia Caroline (Parsons) Weld, made it their home. They previously had lived at 5 Marlborough. They also maintained a home in Wareham. The Welds significantly remodeled the house before taking residence, including relocating the entrance to the street level and adding an oriel window on the second floor. The remodeling was designed by the firm of Lois L. Howe and Manning, architects. 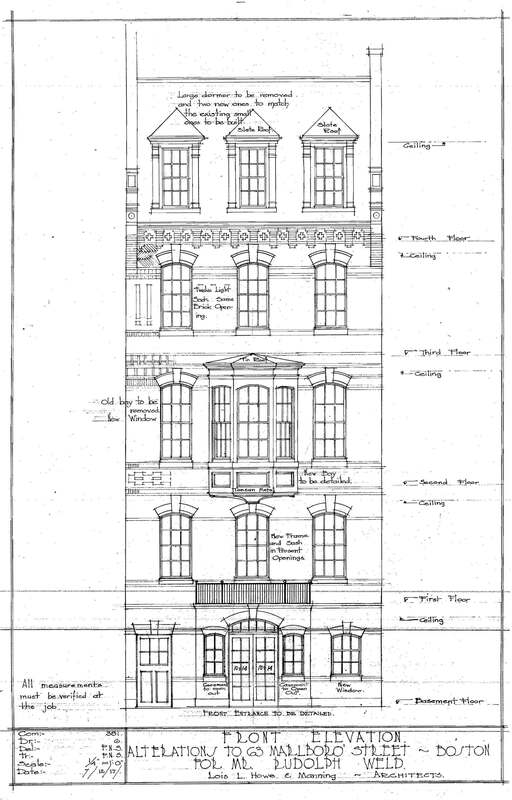 Plans for the remodeling are included in the City of Boston Blueprints Collection in the Boston Public Library’s Arts Department (reference BIN G-8). Click here to view the floor plans for the 1917 remodeling. On January 19, 1922, Rudolph Weld transferred the property to himself as trustee for his three daughters: Sylvia Weld, Eloise Rodman Weld. and Priscilla Alden Weld. The Welds continued to live at 63 Marlborough during the 1926-1927 winter season, after which they moved to Brookline. On June 8, 1927, 63 Marlborough was purchased from Rudolph Weld by Dr. George Colket Caner. He and his wife, Mary Russell (Paul) Caner, made it their home. They previously had lived at 37 Marlborough. They also maintained a home in Manchester. 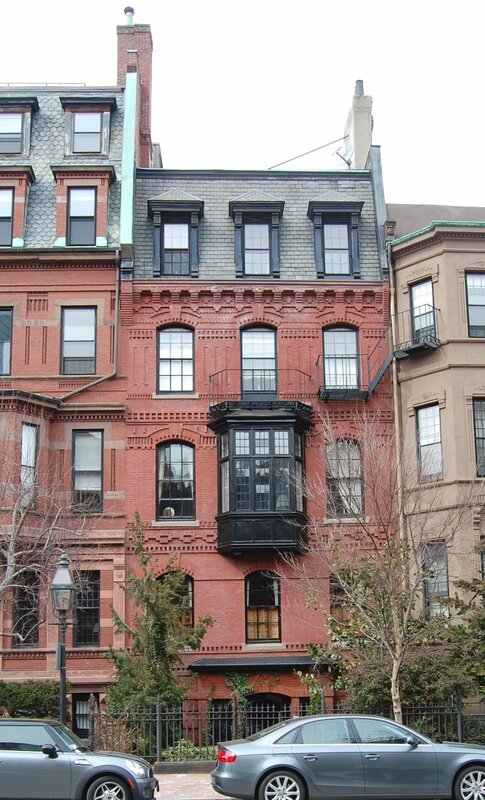 G. Colket Caner was a neurologist and psychiatrist, and also maintained his medical offices at 63 Marlborough. An internationally-ranked tennis player, he had been an American Intercollegiate singles champion and a competitor at Wimbledon, where he and Don Mathey introduced the steel-strung and steel-framed tennis racquet in 1922. In April of 1947, Dr. Caner applied for (and subsequently received) permission to remove a wooden ell at the rear of the house and install a new bay window on the second floor in the rear. The Caners continued to own and live at 63 Marlborough until the mid-1970s. On October 4, 1977, 63 Marlborough was acquired from George Colket Caner by Donald R. Stanton and his wife, and Jeanne D. Stanton. 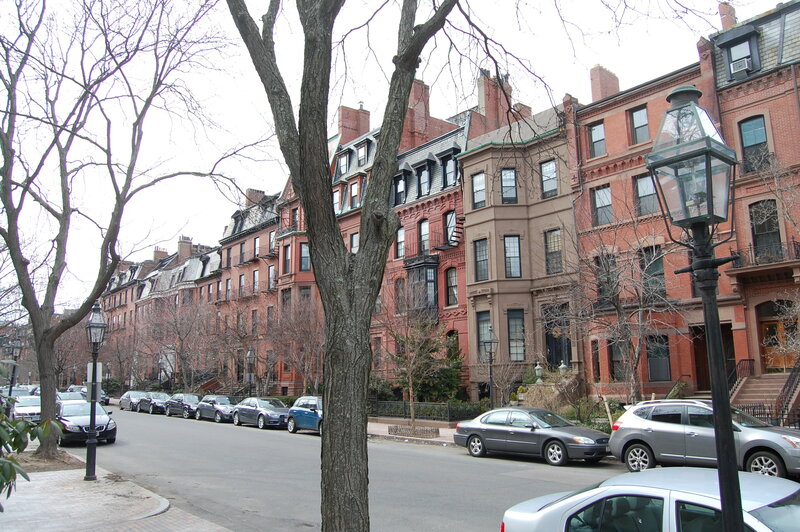 63 Marlborough remained a single-family dwelling in 2015.